The Legian Bali was our first accommodation in Bali. 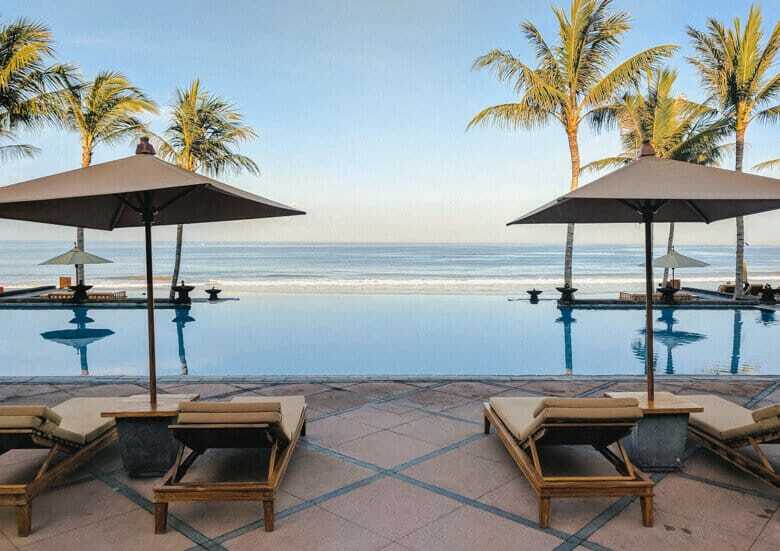 It’s a luxury hotel situated in Seminyak where you can stay in both villas and suites. 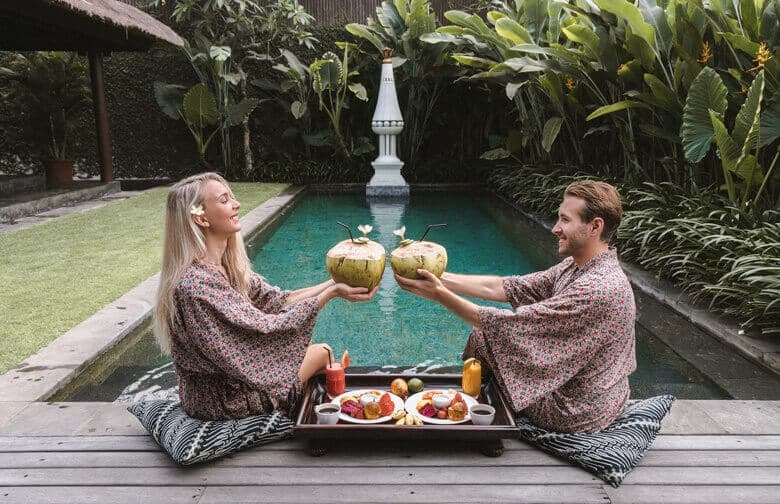 We had the pleasure to experience both, and we stayed 1 night in one of their Villas and 1 night in one of their suites. The villas are located in their own club compound across the street from the reception and other hotel facilities. 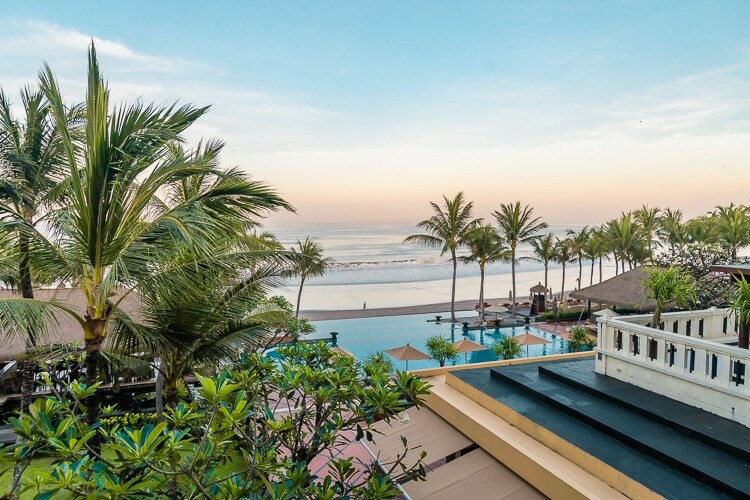 Below, you can read a full review of our stay and experience and what to expect when you stay at The Legian. We arrived pretty late to Bali and due to heavy traffic, we arrived at the hotel shortly after 6 pm. Check-in went smoothly, and we got a welcome drink and some chocolate. Our butler was very accommodating and friendly. The Villa itself features a private pool (awesome), two sunbeds, outdoor bathtub, seating places with cushions and pillows. It’s a lush outdoor area with green here and there as well as your own lawn. 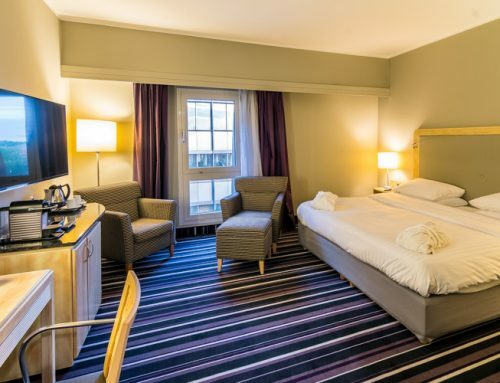 It’s a perfect place for relaxation with a loved one. Inside the villa await spacious rooms divided between a living room, bedroom and shower/bathroom. The open bathroom has two mirrors (perfect if you have to get ready at the same time). Bathrobes are included, shower and toilet are separate, which is also nice. The bedroom features a big and comfy canopy bed that leaves a dreamy impression. You can also listen to music via the iPod or connect your own and play through the Villa’s sound system. In the living room, you have a big sofa, Flatscreen TV as well as a minibar (which is btw complimentary and refilled every day). You can also make your own coffee and tea. The minibar includes some snacks, chocolate by The Legian and various drinks. To summarize our stay in the Villa, even though it was just one night – It’s truly amazing and very romantic. I can’t wait to come back another time and spend some more time in my own villa with a private pool! After checking out from the Villa, we just moved across the street. A buggy came and picked us up and escorted our bags to our new suite with no additional charge. The staff in the reception were welcoming and explained everything about the facilities that we could use. She also escorted us to our suite and gave us a quick tour. In the suite, we had a spacious balcony with an incredible view over the beach and pool area. 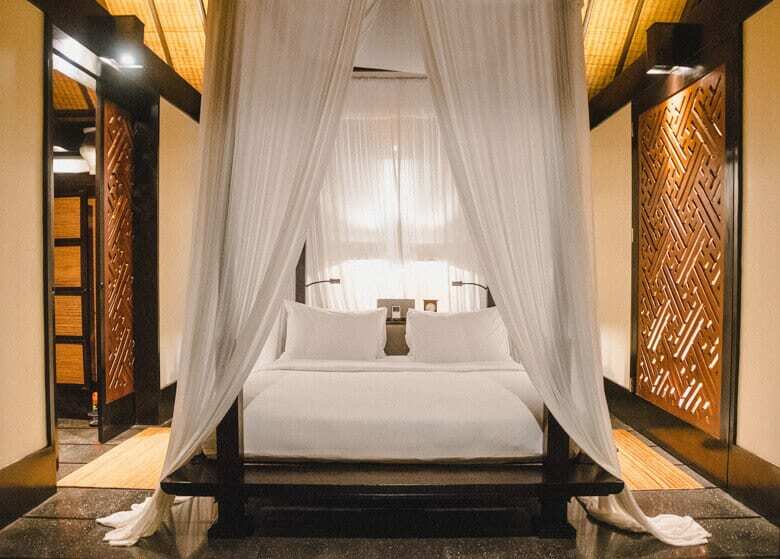 Like the Villa, the suites also feature a dreamy canopy bed. The living room had a round dinner table, sofa and sofa table, a desktop where you could work from. A big bathroom with two sides and two mirrors as well as a shower and bathtub. The minibar is complimentary in the suites just like when you rent a villa. What I liked the most about the suite was how homey it felt. I could definitely see myself living like that for a while. What did I like the most, the villa or deluxe suite? Well, it’s hard to say. For privacy and a romantic getaway I would definitely choose the villa, but for a regular vacation, I would stay in the suites. Comfy canopy bed with soft sheets and comfy pillows. Livingroom area with flatscreen TV, DVD player, CD player and satellite channels. Free Mini-Bar with chocolates, fruits, drinks (non-alcoholic). Our first breakfast was served in the Villa, and we got it served by the pool, which was really nice. Perfect for photos. 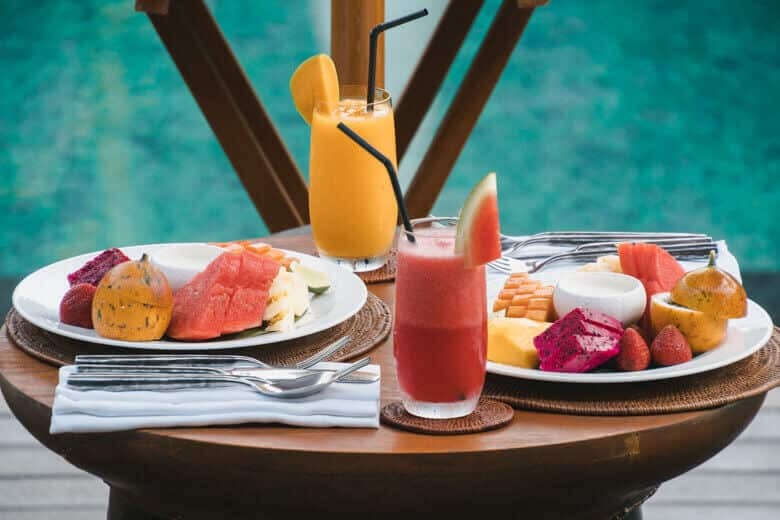 For breakfast, it’s possible to choose from Indonesian styled food, Western and various fruits. We ordered a fruit platter and some Indonesian food as well as coffee and fresh coconuts. The food was very well-made, and you could tell that they care about food quality here. 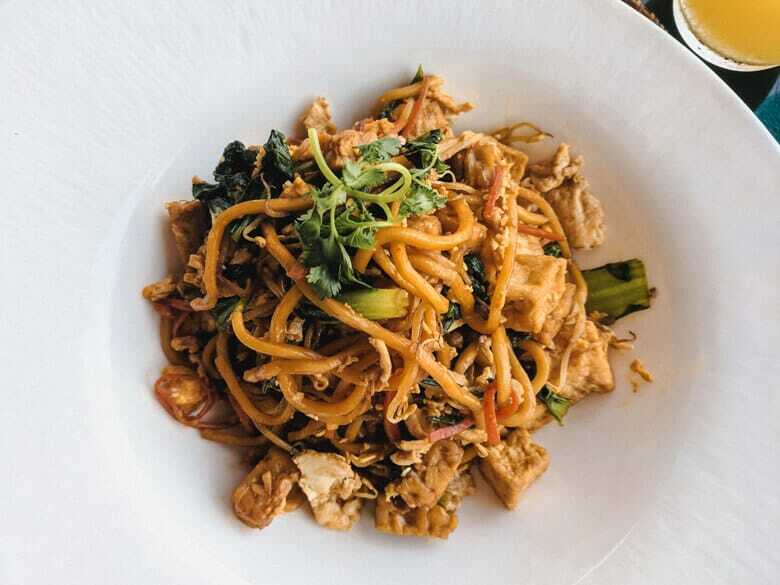 The Mie Goreng was delicious, and so was the Tempeh and Tofu. But my favorite was all the exotic fruits and the fresh coconut! Our second morning when we stayed in the Deluxe suite, we had breakfast downstairs by the common pool area. It’s actually quite lovely and it’s really calm in the morning. We got there early and just took some pictures during sunrise before enjoying the view and various kinds of food. It’s a breakfast buffet, so you can choose and pick whatever you like. My favorite was salmon. I don’t eat meat very often, but salmon is one exception along with cheese and egg sometimes. Overall, I would say that the quality of the breakfast is great, and the staff is very friendly and attentive. As a swede breakfast is the most important meal of the day, and I was more than pleased with the breakfast here at the Legian. Mie Goreng – Not my typical breakfast, but it was good! 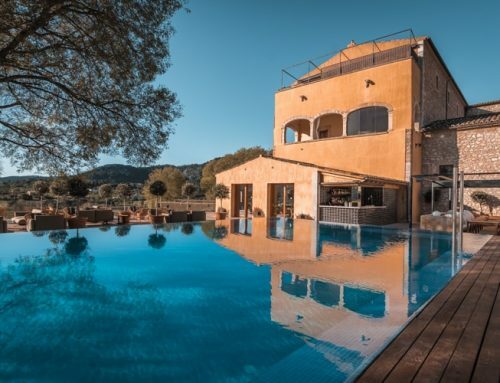 When staying at the Club where villas are located there is a lobby, restaurant and a pool where you can relax on top of the hotel’s other facilities, which include a gym, spa, pool, afternoon tea, sunbeds and much more. Around the hotel, you will also see various statues and temples which give an authentic and interesting feeling while strolling around. I like it when hotels offer afternoon tea or something similar. 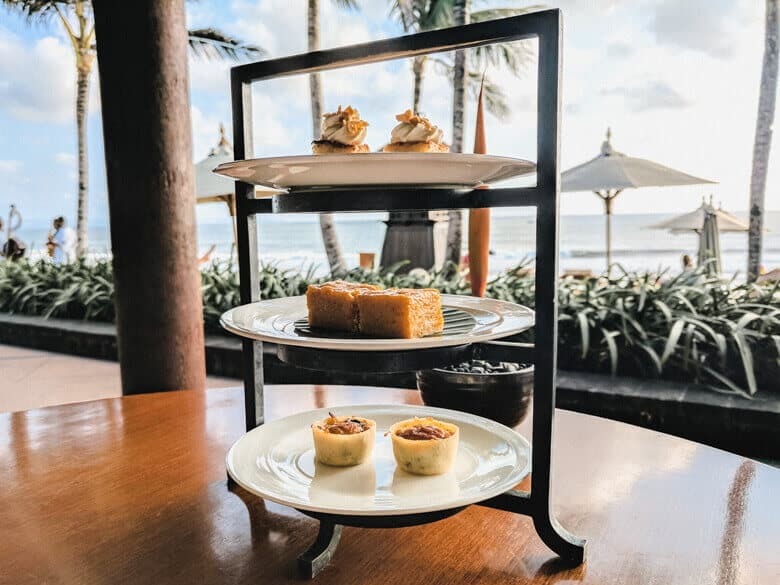 While this wasn’t the afternoon tea I’m used to, it was still served in a similar way and it was interesting to try some new pastries and tea/coffee. And the view is beautiful. Every staff member we met was friendly and greeted us with a smile and hello. They made sure that we were satisfied all the time without being too much, and I like that. We tried the WiFi almost everywhere and since we need WiFi to do our job, it’s quite important. However, there were no issues at all at the Legian. I could even use it some way down to the beach, so the reach is good and the speed as well. 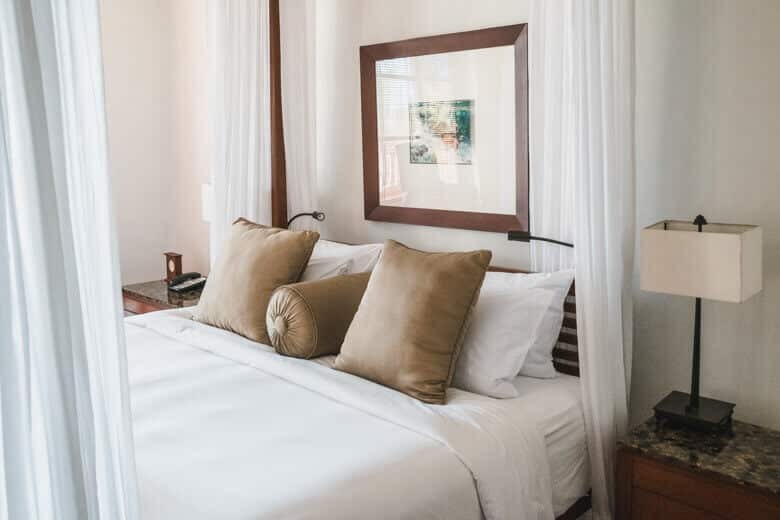 Right in front of the beach in Seminyak within walking distance to everything you want like shopping, bars, and restaurants. It’s still located in a quiet place, which is great when you want to sleep and relax. I’m very pleased with our stay at the Legian. It’s a lovely hotel and If I were to go back to Seminyak I would definitely want to stay here again. 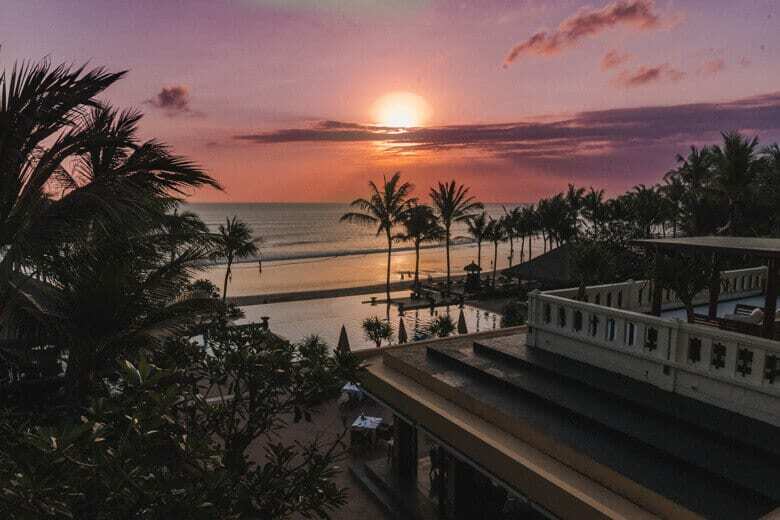 There is not really anything I would like to change, I feel that this hotel has everything you could possibly need and want for a nice vacation in Bali. 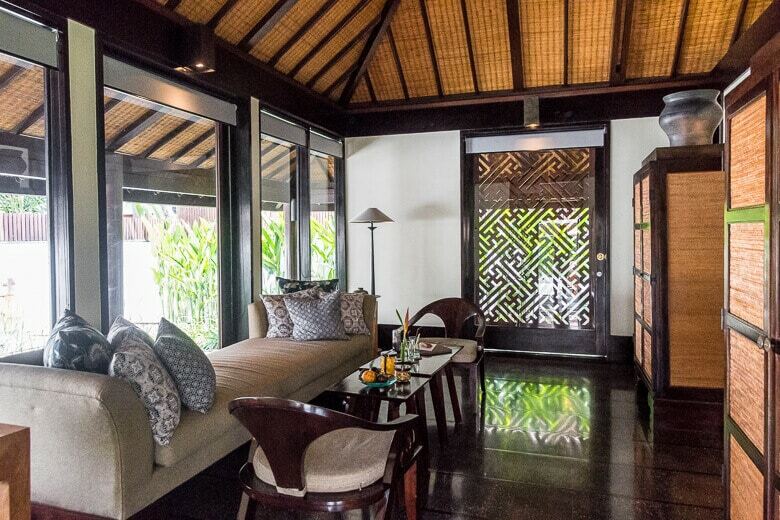 With that said, yes I would definitely recommend others to stay here at the Legian Bali when visiting Seminyak.